When Tower Records, a hallowed music store chain with a 46-year history, shuttered its doors at the end of 2006, The Nation called it "the day the music died." Some cried murder, blaming iTunes and the digital music revolution it fueled. An era of musical discovery — rifling through stacks of records or CDs while chatting up a staff that ate, drank and breathed music — had ended. Who'd want to carry a clunky Discman when the sleek little iPod was around? "Even Bob Dylan was shilling for iTunes in a television ad," wrote the article's author, Max Fraser. Apple launched iTunes just a few years before, on April 28, 2003, and quickly reigned supreme. The iconic commercials — dancing silhouettes against brightly-colored backgrounds — were impossible to ignore. "A thousand songs, in your pocket," the voiceover in some crowed. All your music with you, wherever you go. Once you had an iPod, the iTunes Store had you. Who wanted to purchase an overpriced CD, go home, pop it into a computer, rip the tunes and then sync them to a gadget? The iPod allowed Apple to make its mobile computing revolution, with a little help from its red-hot media store. "Look at the iPhone, the iPad — even the iPad and desktop computers — they would be a lot less meaningful without the media strategy that is iTunes," Rome Thomas, senior vice president of sales and artist development at A&M/Octone Records, told NBC News. Now, on its 10th anniversary, with over 26 billion songs sold, iTunes remains an entertainment powerhouse, having expanded to movies and TV shows and, of course, apps. How is the entertainment industry different? 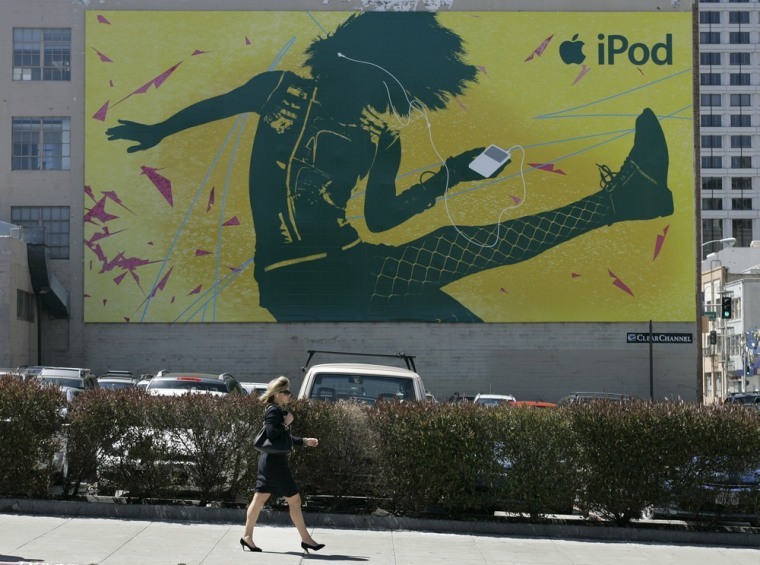 And what does Apple have in store as iTunes enters its second decade? "Apple's new service has a good chance of winning over skeptics on both sides of the aisle, says one analyst," wrote PCWorld's Tom Mainelli following the unveiling of the iTunes Store. At the same time, others, such as the Guardian's Victor Keegan, expressed doubt. "[T]he attraction of all this could wane if Apple's first-mover advantage evaporates," he wrote. The concept of downloading music wasn't a breakthrough. Napster, a peer-to-peer file sharing service, had been around before iTunes was a twinkle in Steve Jobs' eyes. As had other similar services. Once enough people realized that Napster and its kin were, in fact, breaking laws, legal alternatives were dreamed up by everybody with a stake in music or technology. "There were folks doing this 10 years before, but I think [Apple was] the first one to really bring it to the market," Russ Crupnick, senior vice president of industry analysis at NPD Group, told NBC News. "They had a good library of music we really wanted to buy and listen to, had a great interface and a reasonable price." At $9.99 an album or 99 cents per song, Apple offered an affordable alternative to piracy. And though some objected to paying for music, what you got in return was quality. Remember the disappointment of finding that the song you snagged from LimeWire was actually a poorly recorded cover instead of the real thing? Oh, the wasted time (and bandwidth)! But Apple had to walk a tightrope. Sure, offering legal online music sales was something the big labels were interested in doing, but they had been charging $16 or $18 per CD, and suddenly Steve Jobs says he'll sell their music for just $10, even less for just one track. This was a radical shift for the music industry, one that took all of Jobs' charms and manipulations to pull off. "Steve Jobs was able to gain mindshares at the record labels who were fearful at the time," Thomas said. By mid-2004, iTunes was offering more than one million songs — just 1.5 percent of the U.S. music industry revenue, according to the Recording Industry Association of America (RIAA), but the situation was changing rapidly. The iPod line was expanding, the iTunes Store was gaining popularity outside of the U.S., and traditional music shops — including the much-beloved Tower Records — were flinching collectively. By 2012, just 39.9 percent of music industry revenues came from CDs and other physical media. But Apple's own grip on the music business — based on "owning" digital copies of albums and songs — began to relax after 2010, as subscription and streaming alternatives such as Spotify — not to mention video services from Netflix and Amazon — began to make better use of the very smartphones Apple made popular. "iTunes’ share of U.S. digital music sales has fallen from 69 percent to 63 percent as avid music listeners turn to streaming services,"Bloomberg's Andy Fixmer recently wrote. "I think the idea of purchasing music the way we have in a modern era — whether that has been through CDs, cassettes, or digital downloads — will diminish over the next years" Crupnick said. "We're gonna see Apple evolve around that. On the 20th anniversary … we'll be talking about [its] streaming services." "No one at the company has formally introduced it … but you hear about Apple's interest in providing a radio format," Thomas remarked, speculating — perhaps jokingly — that the service could be called "iRadio." While it fits with industry gossip, "iRadio" clashes with how Jobs saw things. "He believed that people had an emotional connection to the songs they loved," Walter Isaacson explains in Jobs' biography. "They wanted to own 'Sympathy for the Devil' and 'Shelter from the Storm,' not just rent them." "I think you could make available the Second Coming in a subscription model and it might not be successful," Isaacson quotes Jobs as saying. But the rumors aren't going away. Perhaps news of an Apple subscription media service will come as early as June, when Apple hosts its annual Worldwide Developers Conference (WWDC). "Could Apple crack the code?" Crupnick wondered. "Maybe. Is it part music, part video, part books? Will we have an entertainment subscription where we pay a certain amount per year and we get all the music, video and books we want? Maybe." iTunes killed the music shop in the last decade, but Apple's own retail operation may be in jeopardy if it doesn't evolve for the next decade.